"36 Then Jesus went with his disciples to a place called Gethsemane, and he said to them, 'Sit here while I go over there and pray.' 37 He took Peter and the two sons of Zebedee along with him, and he began to be sorrowful and troubled. 38 Then he said to them, 'My soul is overwhelmed with sorrow to the point of death. Stay here and keep watch with me.'" "40 On reaching the place, he said to them, 'Pray that you will not fall into temptation.' 41 He withdrew about a stone's throw beyond them, knelt down and prayed, 42 'Father, if you are willing, take this cup from me; yet not my will, but yours be done.' 43 An angel from heaven appeared to him and strengthened him. 44 And being in anguish, he prayed more earnestly, and his sweat was like drops of blood falling to the ground. 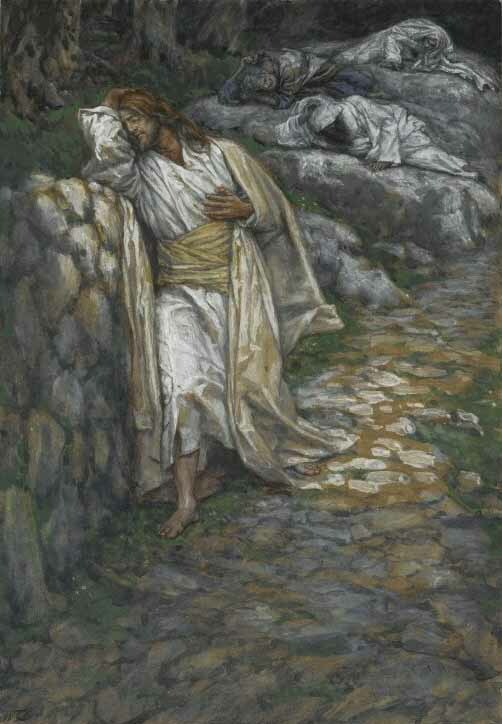 45 When he rose from prayer and went back to the disciples, he found them asleep, exhausted from sorrow. 46 'Why are you sleeping?' he asked them. 'Get up and pray so that you will not fall into temptation.'"